Just around the corner from the busy shops and restaurants of Thames Street is the Robert Long House at 812 South Ann Street, the very image of a handsome eighteenth century colonial residence and one of the oldest homes in Baltimore. However, this is only the most recent chapter in a long and varied history for this architectural treasure. In 1765, Robert Long built his 28 square foot home on three plots of land purchased from Edward Fell, who first established Fell’s Point in 1731. The first two plots would hold the home and garden. The third, housed a warehouse which Long eventually sold in 1771. Two centuries later, in 1975, the Society for the Preservation of Federal Hill, Montgomery Street and Fells Point (now known simply as the Preservation Society) started planning the restoration of the Robert Long House. The Robert Long House exemplifies the life of an ordinary merchant in the eighteenth century. Many of the historic houses in Baltimore belonged to wealthy landowners or public figures showing the high class culture of the time. Conversely, the Robert Long House speaks to the daily life of an ordinary merchant. The Maryland State Society Daughters of the American Revolution made the furnishing of the first floor parlor their U.S. Bicentennial project. Inside, historic objects like the beaded baseboard, molded chair rail, baluster staircase and plaster walls made with deer or cow hair reflect the period construction and design. By 1984, the Preservation Society completed most of the interior and the Perennial Garden Club finished roughly half of the garden. The club populated the grounds with “of the era” plants and herbs and ran a crushed Oyster shell walkway from the back door to the back gate. To the tune of $125,000, the renovations included an upstairs office for the Preservation Society. Unfortunately, a building fire in December 1999 caused major damage to the offices and the building’s roof. Neighbors quickly helped remove a 200-year-old grandfather clock before the ceiling collapsed. Firefighters had to destroy much of the roof to contain the blaze and left the first floor parlor with severe water damage. At the time, the society had been raising money for a maritime museum and visitors’ center. With the cost of the damage, those hopes had to be postponed. 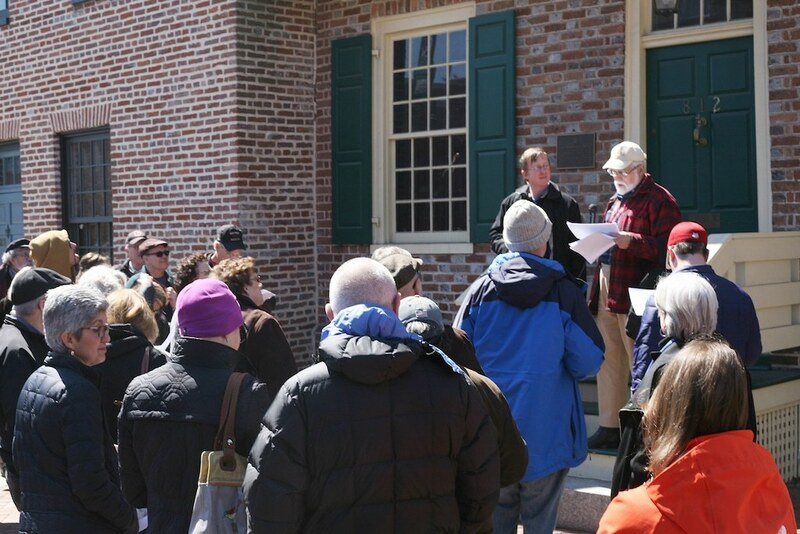 Celebrating the 250th anniversary of its completion in 2015, the house tells the stories of the rise of Fell's Point as a major East Coast port, the growth then decline of American industrial technologies, the diverse and multiple waves of immigration for over 180 years and now the rise of a modern, vibrant historic seaport neighborhood. Sierra Hallmen, “Robert Long House,” Explore Baltimore Heritage, accessed April 19, 2019, https://explore.baltimoreheritage.org/items/show/511.